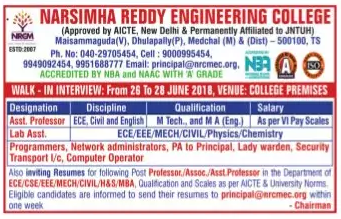 Narsimha Reddy Engineering College, Secunderabad has advertised in the SAKSHI newspaper for the recruitment of Teaching Faculty- Professor / Associate Professor / Assistant Professor Plus Non-Faculty jobs vacancies. Interested and eligible job aspirants are requested to walk-in on 26th, 27th and 28th June 2018. Check out further more details below. About College: Narsimha Reddy Engineering college (NRCM) is promoted & managed under the inspiring & dynamic Chairmanship of Sri. J. Narsimha Reddy and the fleet of dedicated members. This is the first institution belonging to JAKKULA EDUCATIONAL SOCIETY has been established in 2007 to serve the people of this backward region of the state of Andhra Pradesh (India). M.Tech / M.A (English) for Assistant Professor Walk-in Posts and As per AICTE / University norms for other teaching posts. How to Apply: Interested and eligible candidates are requested to appear for Walk-in interview along with CV, originals & copies of certificates, copy of PAN card, copy of Aadhaar card, and recent passport size photos to the walk-in address given below.